Phasion Canna. Ann Lapides, Sugar Creek Gardens. Plumbago. Christine Knoernschild, Passiglia's Nursery. Japanese maple. Sarah Riley, Bowood Farms. Fiesta Hibiscus. Andria Graeler, Chesterfield Valley Nursery. Variegated Tapioca. Mike Curran, Timberwinds Nursery. 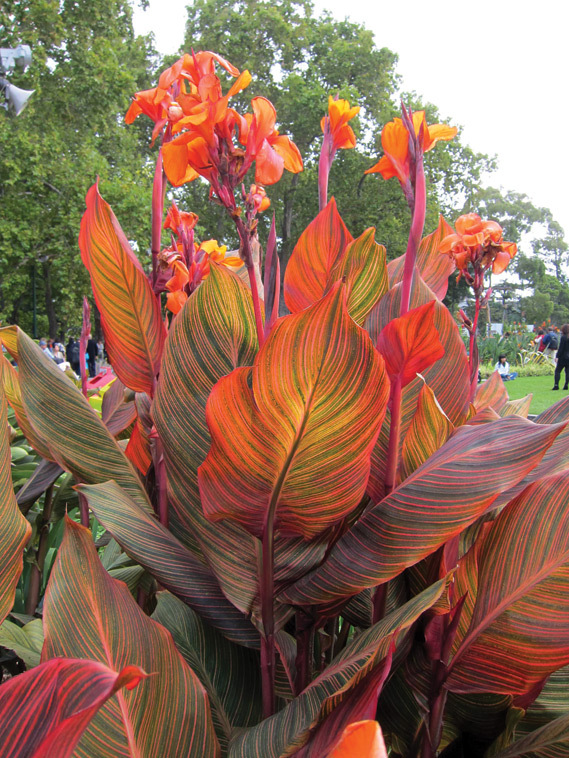 “If you are looking to create a flamboyant color spectacle, Phasion Canna makes the perfect choice, fantastic as a stunning centerpiece of floral arrangements, or planted by themselves. It features exotic banana-like, striped foliage of green, yellow, pink and red with brilliant tangerine orange, torch-like blooms. It prefers full sun.” Ann Lapides, Sugar Creek Gardens. 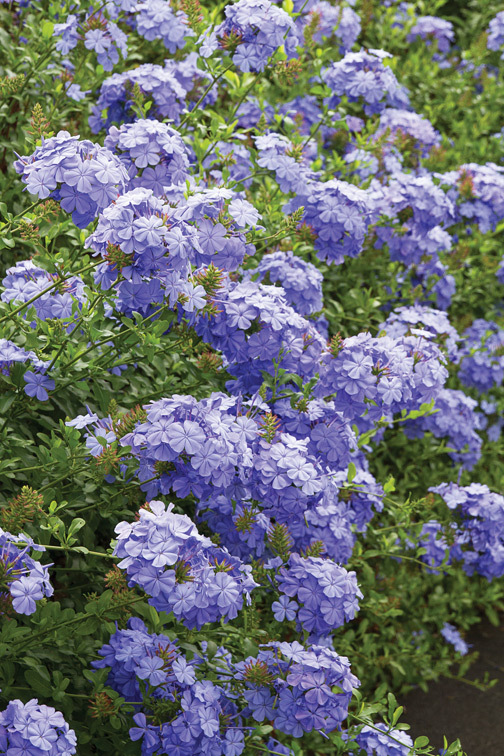 “The long-blooming, vivid blue flower clusters on this tropical shrub make it an excellent container choice. Plumbago’s bushy habit will fill in a planter nicely.” Christine Knoernschild, Passiglia’s Nursery. 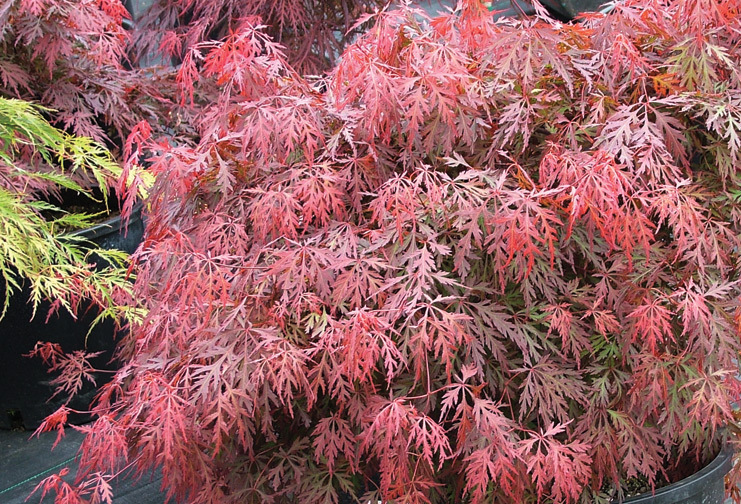 “Japanese maples are the perfect statement plants for large containers. Acer ‘Orangeola’ has delicate cascading branches and does well in the sun. The serrated leaves emerge in shades of green and orange that fades into purple then back to green by summer and develop into a bright red-orange hue for fall. Be sure to plant it in a container that can survive being outdoors all year round.” Sarah Riley, Bowood Farms. 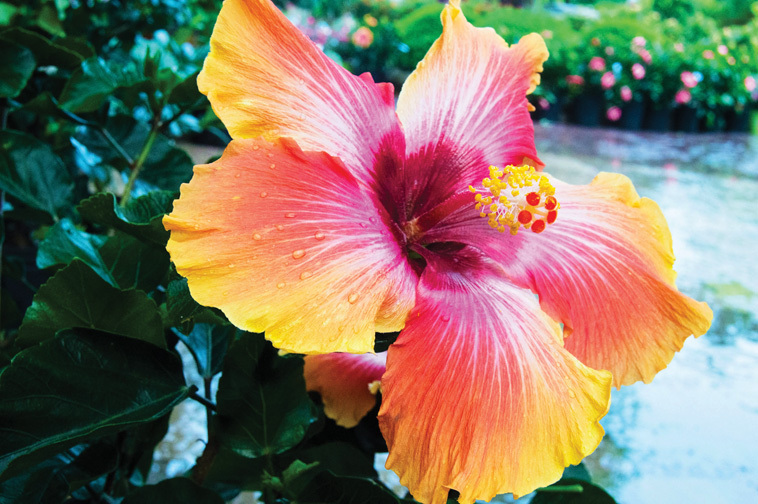 “The Fiesta Hibiscus is a gorgeous, tie-dye colored tropical. Flowers bloom in an array of colors from orange with pink centers, to yellow with white and red centers, or the much-envied splashes of yellow, orange, pink, white and deep magenta like the one pictured here. This tropical will make an impressive summer statement as a bush or braided tree in any planter!” Andria Graeler, Chesterfield Valley Nursery. 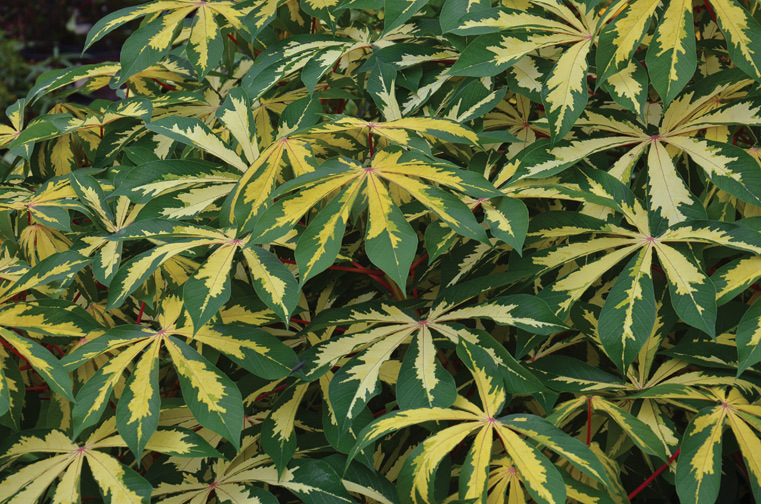 “Variegated Tapioca is a showy ornamental with vivid chartreuse/yellow patterned leaves atop bright pink stems. It loves our Missouri heat; best in morning sun with a little afternoon shade. It doesn’t like it cold, so it should stay inside until after Mother’s Day. A great ‘one pot wonder’ in a cobalt blue pot!” Mike Curran, Timberwinds Nursery.